One of the biggest misconceptions about the Reformation involves its causes. The typical narrative is that people grew angry with the Church for its wealth and abuses, especially its taxes and the sale of indulgences. Martin Luther criticized those abuses and came up with new beliefs. and that caused the Reformation. The pope became angry because Luther questioned his authority over the Church and beliefs. Although this is true (even though the story about Luther nailing the Ninety-five Theses to the church door in Wittenberg is not supported by evidence) this narrative misses the point. Luther was certainly not the only person within the Church who criticized the sale of indulgences, and not alone in questioning the authority of the pope. The Church had survived numerous periods of criticism, followed by reform, during its long history – in the fourth century, when the Church fathers and councils reorganized its structure, in the tenth and eleventh centuries with the Cistercians and Cluny, and in the thirteenth century, with the formation of the mendicant orders. The fundamental threat that Luther posed to the Church was not about indulgences, but about basic doctrine. The Church had one theory of salvation, and Luther had another. The Church’s theory (now the same doctrine followed by the Roman Catholic Church) is that humans can be saved from sin by grace (that is, faith in God and God’s merciful actions) and by works (that is, penance and good deeds.) Priests administered God’s grace to lay people through the seven sacraments. Luther’s theory of salvation was different. In 1519, he came to believe that humans were “justified by faith” alone, that is, saved by God’s grace alone. He also eliminated those sacraments that did not have Biblical authority, and said that all believers were priests. All of the above is probably quite familiar and understandable to you, but these are the kind of abstract concepts that are incredibly difficult for 7th-graders to understand. They can memorize the words, but they do not grasp why the changes were important. “I had conceived a burning desire to understand what Paul meant in his Letter to the Romans, but thus far there had stood in my way . . . that one word which is in chapter one: “The justice of God is revealed in it.” I hated that word, “justice of God,” which . . . I had been taught to understand . . . [as] that justice by which God is just and by which he punishes sinners and the unjust. But I, blameless monk that I was, felt that before God I was a sinner with an extremely troubled conscience. I couldn’t be sure that God was appeased by my satisfaction [the penance he did for his sins]. I did not love, no, rather I hated the just God who punishes sinners. . . . I said, “Isn’t it enough that we miserable sinners, lost for all eternity because of original sin, are oppressed by every kind of calamity through the Ten Commandments? Why does God heap sorrow upon sorrow through the Gospel and through the Gospel threaten us with his justice and his wrath?” This was how I was raging with wild and disturbed conscience. . . . I meditated night and day on those words until at last, by the mercy of God, I paid attention to their context: “The justice of God is revealed in it, as it is written: ‘The just person lives by faith. '” I began to understand that in this verse the justice of God is that by which the just person lives by a gift of God, that is by faith. I began to understand that this verse means that the justice of God is revealed through the Gospel, but it is a passive justice, i.e. that by which the merciful God justifies us by faith [or the merciful God makes us righteous by faith], as it is written: “The just person lives by faith.” All at once I felt that I had been born again and entered into paradise itself through open gates. . . . I know this piece is too long, and I’d appreciate advice on how to cut it further. But, in the meantime, I’ve made up Martin Luther Source and Activity to help students grasp the meaning. I suggest that teachers do this primary source reading and literacy activity with students, rather than giving it to students to do on their own. RH2. Determine the central ideas or information of a primary or secondary source: provide an accurate summary of the source distinct from prior knowledge or opinions. RH3: Identify key steps in a text’s description of a process related to history/social studies. RH4: Determine the meaning of words and phrases as they are used in a text, including vocabulary specific to domains related to history/social studies. This is just a draft, and I’d love to hear your feedback on it. Source for text: Martin Luther, “Preface to the Complete Edition of Luther’s Latin Works (1545”, trans. By Bro. Andrew Thornton, OSB, “Vorrede zu Band I der Opera Latina der Wittenberger Ausgabe. 1545” in vol. 4 of _Luthers Werke in Auswahl_, ed. Otto Clemen, 6th ed.,(Berlin: de Gruyter. 1967). pp. 421-428. http://www.projectwittenberg.org/. 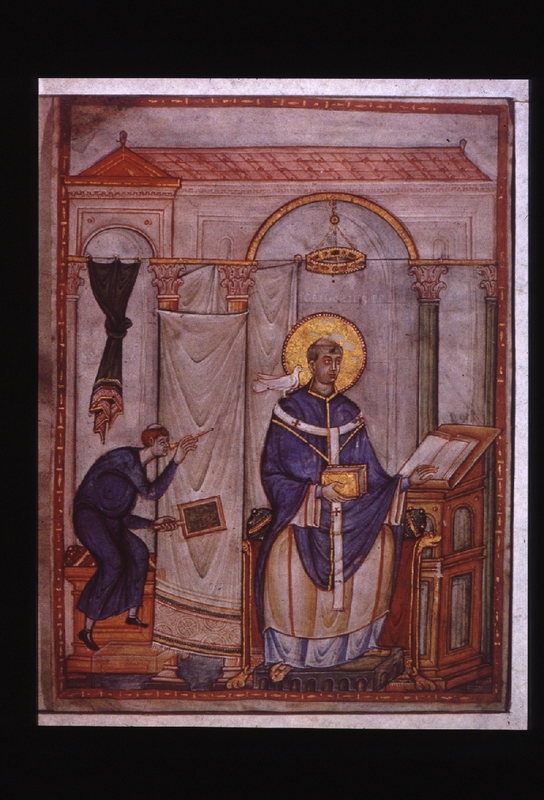 Source for visual: Pope Gregory the Great with dove, Germany, c. 983-7, From the Collection of Joan Cadden, History Project at University of California, Davis Marchand Archive, http://historyproject.ucdavis.edu/ic/image_details.php?id=10750l Stadtbibliothek, Palais Walderdorff, Domfreihof 1b, 54290 Trier, GERMANY. Online at http://www.stadtbibliothek-trier.de. In George Zarnecki, “Art of the Medieval World: Architecture, Sculpture, Painting, The Sacred Arts,” (Copyright © Abrams, 115 W 18th St, 6th Fl, New York, NY 10011) 1975, color pl. 27. All rights reserved.